I have to wonder what my best 4th of july has been over the years. I don’t remember spending many (or any) independence days in the phoenix valley, mostly because the heat was too unbearable. it was mostly spent in the white mountains at our family cabin or in the small town of st. john’s where my cousins lived. those days involved a town bbq of baked beans and pit roasted meat which we ate under a big oak tree on patriotic blankets. we would race down the hill for a snow cone (watermelon, thank you very much) and then down to the park for activities. the day always finished with long naps on the trampoline at my cousin’s house while we licked dilly bars or whatever the schwan man had brought along with small town fireworks. or, there was 4 years ago when I lived in boston. 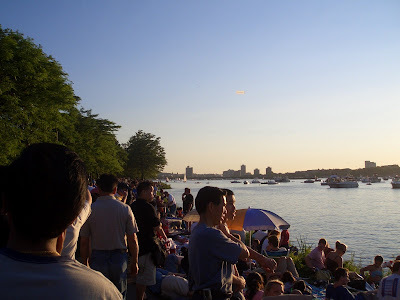 a large group of church friends staked out a spot on the charles river at the crack of dawn and saved our spot so we could listen to the boston pops play during the fireworks. up until that point, I had never seen such an amazing display of fireworks which reflected on the water of the chuck. afterwards, the friends and I opted to walk to cambridge and I have some great memories of flirting with one boy in particular who offered to walk me home. nothing came of it (obviously) except for one fun summer. 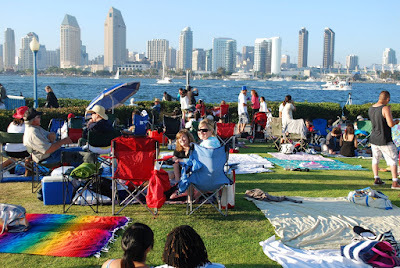 but – for this year’s festivities we thought we better take advantage of one of several san diego independence day fireworks displays. 1st choice (per usual for almost any activity): coronado island. we made a picnic complete with turkey sandwiches, fresh cut watermelon and pineapple, brownies and Pellegrino and staked out our spot near the glorietta bay. two hours later of people watching in delicious weather and we were viewing huge fireworks just above our heads while wrapped in blankets. it was truly spectacular. I couldn’t have asked for a better spot. the patriotic music that several fellow onlookers played from their stereos made my throat swell up when I thought about how much I love this country. as the live feed played “god bless the usa” I thought to myself how this san diego experience was a great blend of the small town experience I enjoyed growing up coupled with the big city experience I marveled at in boston. I’m loving san diego for being a small big city – a wonderful oxymoron. I sure hope you have some memories of the golf course. My 4th of July's have never been the same. Fireworks in San Diego are the absolute best! We watched them at the Mesa Country Club this year, and lets just say it was nothing compared to Cali, especially because I was dying of heat exhaustion! 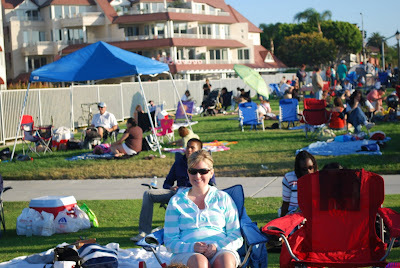 My family went to fireworks in San Diego this year too, but I think they went to La Jolla to watch them! Glad you guys had a great 4th of July! I miss you lots! 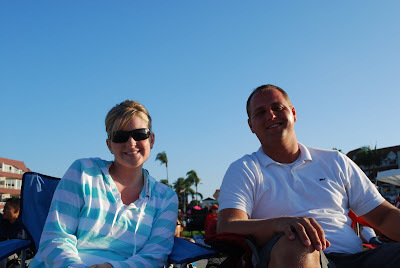 Thanks for the Coronado post and link to eCoronado.com. Join our site if you want to be an online Islander! That is my favorite firework show I have ever been too! I love Coronodo Island! Funny, This year on the 4th I was thinking about how you lived in Boston for the 4th and how cool you said it was!